Fabric & Care / 100% Chiffon Silk: Hand wash cold, hang dry. Dye may bleed slightly as all natural fabric does. Rinse thoroughly. Dry iron as needed. 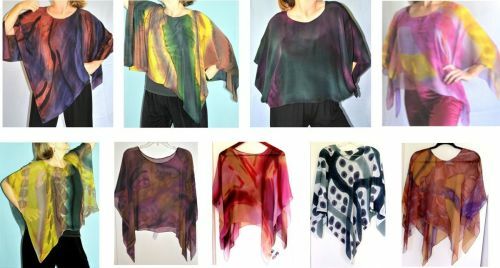 Hand-painted silk of crepe de chine or chiffon silk drape the body beautifully. Best of all, you can choose your own colors to match that perfect dress or pants you have! 1) Choose fabric: either in classic crepe de chine silk or the lighter, dreamy chiffon silk. 2) Choose the Hot Lava colorway (reds/pinks/oranges/black) as in the photo, or 3 colors you want. If you want your poncho similar to one in the photo, in the comment box state an example: "Like the bottom row, 3rd from left." 3) Place the order by selecting the add to cart button. In the comment box, state your fabric and color choices. I will email you a photo of your hand-painted piece before sending for approval. Allow 10-20 days delivery from date of placing order. 4) Full guarantee if not satisfied. See purchase info page for details. Fabric & Care / 100% Silk: Hand wash cold, hang dry. Dye may bleed slightly as all natural fabric does. Rinse thoroughly. Dry iron as needed. 2) Choose the Rainforest colorway (golds/browns/greens) as in the photo, or 3 colors you want. If you want your poncho similar to one in the photo, in the comment box state an example: "Like the bottom row, 3rd from left." 2) Choose the Ocean colorway (blues/aquas/turquoise) as in the photo, or 3 colors you want. If you want your poncho similar to one in the photo, in the comment box state an example: "Like the bottom row, 3rd from left." Turn your look into something with elegance, sophistication, and flair. It’s called a fitted scarf, hand-painted, with 3” beaded embellishments and can be worn many ways, each one an original look. 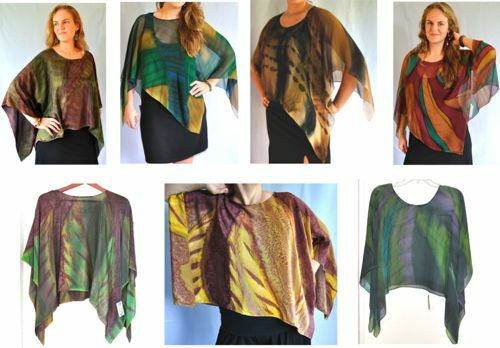 Shoulder wrapped beaded chiffon silk elegant with evening wear or jeans. Wear off shoulder with ends draping, or tie ends. Wear beads in front and loose ends or tie them. Take that LBD, little black dress, and elegantly drape beads in center back with cowl neckline in front. If you want your poncho similar to one in the photo, in the comment box state an example: "Like the bottom row, 3rd from left." 2) Place the order by selecting the add to cart button. In the comment box, state your colorway choices. I will email you a photo of your hand-painted piece before sending for approval. Allow 10-20 days delivery from date of placing order. 3) Full guarantee if not satisfied. See purchase info page for details. 2) Choose the Royal colorway (purples/blues/burgundy) as in the photo, or 3 colors you want. If you want your poncho similar to one in the photo, in the comment box state an example: "Like the bottom row, 3rd from left." A comfortably elegant wrap in a loose tunic style with open sides, a perfect roomy fit over a simple tank top. 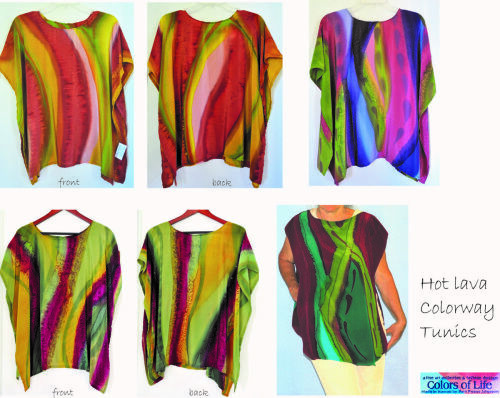 If you want your tunic similar to one in the photo, in the comment box state an example: "Like the top row, 3rd from left." 2) Place the order by selecting add to cart button. In the comment box, state your colorway choices. I will email you a photo of your hand-painted piece before sending for approval. Allow 10-20 days delivery from date of placing order. 2) Choose the Royal colorway (purples/blues/burgundy) as in the photo, or 3 colors you want. 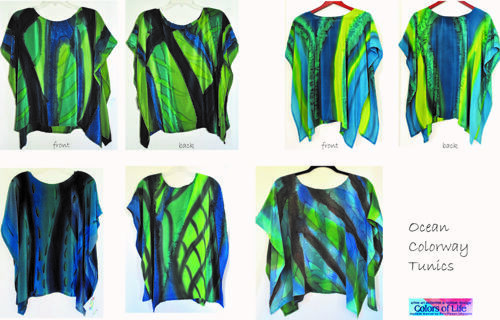 If you want your poncho similar to one in the photo, in the comment box state an example: "Like the bottom row, 1st from left." 3) Place the order by selecting add to cart button. In the comment box, state your fabric and color choices. I will email you a photo of your hand-painted piece before sending for approval. Allow 10-20 days delivery from date of placing order. 2) Choose the Oceans colorway (blues/aquas/turquoise) as in the photo, or 3 colors you want. 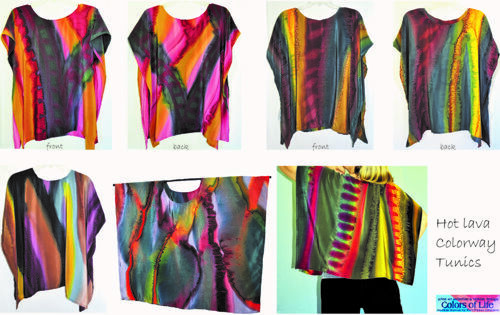 If you want your poncho similar to one in the photo, in the comment box state an example: "Like the bottom row, 1st from left." 2) Choose the Hot Lava colorway (reds/pinks/oranges/black) as in the photo, or 3 colors you want. 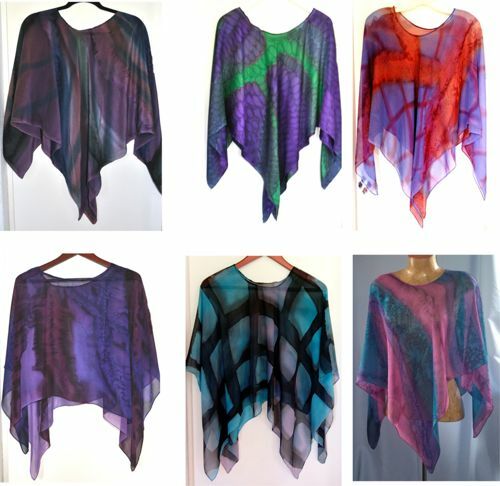 If you want your poncho similar to one in the photo, in the comment box state an example: "Like the bottom row, 1st from left." 2) Choose the Rainforest colorway (golds/browns/greens) as in the photo, or 3 colors you want. 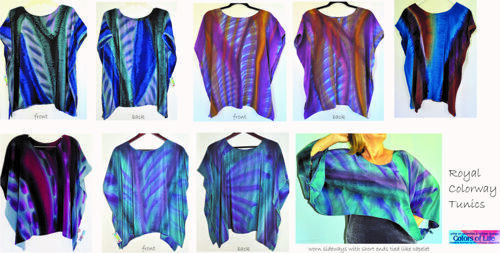 If you want your poncho similar to one in the photo, in the comment box state an example: "Like the bottom row, 1st from left." 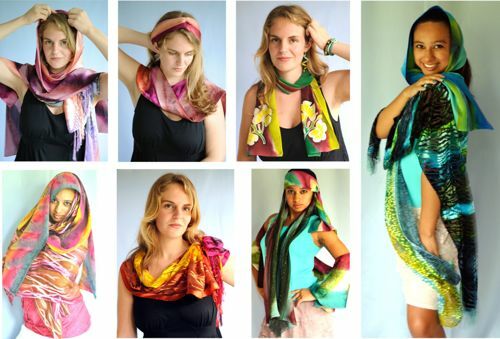 Hand-painted scarves in luscious colors on beautifully draping silk fabrics. Professionally steam set dyes used for lasting color and wear. Each one is different. It’s all about enhancing your look with simplicity, yet with elegance and sophistication. A simple scarf does this fabulously, and with minimal effort. Includes a scarf tying brochure. Approximately 10-20 days for delivery. (plus $8.00 s/h for USA locations by U.S.P.S.) per order. 5) Full guarantee if not satisfied when you receive product. See purchase info page for details.